The London borough of Enfield has decided to put up a standard notice in all its parks warning about the risks of ticks carrying Lyme Disease. Until now only those greenspaces in country areas, with deer and sheep etc were considered a risk needing a warning notice. Now, Enfield are covering themselves in all parks, even those without much long grass. This in turn has caused Enfield’s Millennium Green in New Southgate to consider doing the same, and to warn other Millennium Greens around the country to consider the same warning, just in case. 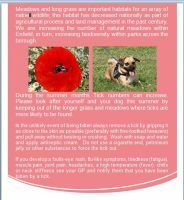 May is considered the time when warmer weather will bring the ticks out and problems are likely to start. Lyme is not that common in the UK, but the disease can last for weeks or months in sensitive individuals and can even kill.